Macon County and Municipality share of state collected on-line sales tax. (SSU is currently disbursed the month following the end of a quarter so you can search for a particular quarter’s payment or to get the amount paid to date, select From the oldest (Jan 2016) To the most current (June 2017). Effective with the July 2017 distribution, the funds will be disburses monthly. Macon County Commission: office 334-724-2557 and my county web page. County work session and business meetings are both now on the second Monday of every month. The work session is between 5:00 p.m. and 5:45 p.m. and where the majority of discussion into an agenda item takes place. The general session, where most often little of an agenda item is discussed, but voting takes place begins at 6:30 pm. Both meetings are in the County Chambers across the street from the County Court in Tuskegee. Recreation and Community Centers - call 334-724-2557 for services and use of ball fields and indoor facilities. 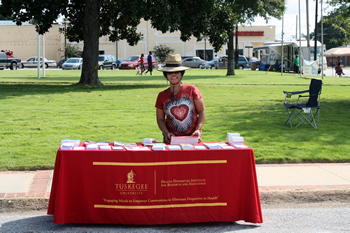 Tuskegee Senior Citizens, 202 E. Martin Luther King Hwy, 334-724-2137. An enrollment form is required for lunch between 11:30 a.m. to 12:00. Arrangements can be made to transport Tuskegee citiens to their pharmacy, grocery store, doctor's office. Regional Planning Councils & Area Agency on Aging Contacts - South Centeral Alabama Development Commision, Tyson Howard, Executive Director, Sharon Redd, AAA Director 334-244-6903. Macon County Board of Education: office 334-727-1600, web site, school board member bios, and school board meeting minutes. Meetings are generally the third Thursday of each month at 6:30pm. Location of the meetings vary - so check first. Mailing and physical addresses: Macon County School District, P.O. Box 830090 501 S. School Street, Tuskegee, AL 36083. If you are interested in knowing why thousands of tax dollars are not in our Macon County class rooms - look no further than here. Macon County Retired and Senior Volunteer Program (RSVP) - if you have an elderly live-along neighbor or family member who would benefit with a daily telephone call check-in please call Ms. Florence Pace-Tyner at 334-724-2605 with their name, address, and telephone number. Ms. Tyner reported during the July County meeting the RSVP checks in with 100 of our elderly neighbors daily - immediately reporting problems and emergencies to the local law enforcement agencies. Macon County Economic Development Authority flexed their muscle in leading the way to land CSX Railroad Select Site program to Notasulga where several hundred jobs may be in the offering. 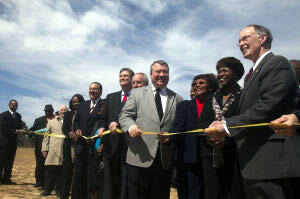 This site is the first in Alabama and was recognized during the ribbon cutting ceremony of March 4, 2013. Governor Bentley, extreme right, with Representative Pebblin Warren to his right. Senator Billy Beasley with red tie holding holding the ribbon. Members: Noah Hopkins, at-large; Rhonda McCloud, at-large; Myrtle E. Adams, District 1; Benjamin Rackley, District 2; Terrence Johnson, District 3; District 4 vacant; Patricia Clay, Senator Beasley appointment; Representative Warren appointment, vacant; Dr. Ellis Hall, Health Care Authority. City of Franklin - 334-727-2111, Town Council meetings: 2nd Tuesday at 7:00 p.m. Work session is at 6:30 p.m. immediately preceeding the general session. City of Notasulga - 334-257-1454, Town Council meetings: 3rd Monday at 7:00 p.m.
City of Shorter - 334-727-9190, Town Council meetings: 2nd Thursday at 4 p.m. Shorter Comprehensive Plan, Shorter Subdivsion Regulations, Shorter Zoning Ordinance. City of Tuskegee - 334-720-0515, Town Council meetings: 2nd and 4th Tuesday at 6:00 p.m.
Read here the Assessment of Lottery and Gaming Programs Across the United States by the Institute for Accountability and Government Efficiency of Auburn University at Montgomery commissioned by Senator Marsh Senate pro tem office. Note: Your Macon County Commissioner along with Chairman Maxwell do not understand our wallets have bottoms. We can not steal from our neighbors as they can take from us. Recently they attempted to do all but empty our wallets for governmental growth. Publicly I recently asked the chairman, if he was asking me to sacrifice how will the county sacrifice? Not grasping the intensity of the question or having completely lost touch with the community who elected them to serve, he stated the commission has been sacrificing. I reminded him he is driving a county vehicle 24/7. 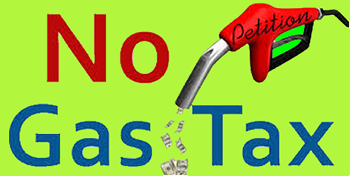 Four of five commissioners, less Commissioner Huffman, on Wednesday, 15Apr2015, in Montgomery have asked Senator Beasley and Representative Warren to introduce legislation for a 2-cent county-wide fuel tax without the say of the people. This additional tax will only drive our gasoline prices yet higher than already found 20 miles to the east of us or 40 miles to the west. Have any of our commissioners ever taken Econ 101? Note: Do you know where your nearest county storm shelter is? Looking for it while hurricane or tornado winds and rains are upon you is unwise. Know of the locations and drive the route today. Call the commission office (334-724-2555) and to learn the location of your shelter. Notasulga's is at the end of Lori Lane. Within 1/2 mile or so upon passing Liberty City Gas on Hwy 14 Lori Lane will be on your left. Did you know AL.com reports that Macon County will lead the state in 2040 with population loss at 4,862 people or 22.7 percent, which is on the same trajectory since 1980. So in 2015 the county wants new taxes? Tax those who can either afford the additional expenses of living in Macon County along with those who can not afford to leave the county; the commissioners are creating a society of two classes, well off and poor. There will be no middle class in Macon County in 2040. Did you know how to rid and protect stored clothing and home of mildew. Did you know according to Ms. Florence Pace-Tyner, former Retired and Senior Volunteer Program Director, their volunteers check on 100 of our live-alone elderly neighbors by telephone every day of the year. If you have an elderly neighbor or family member living alone who would benefit with a daily telephone call, provide their name, address, and telephone number to 334-724-2605. Did you know according to Christine Rousselle of Townhall.com our Macon County along with Greene, Hale, and Lowndes Counties "had more active, registered voters than what the census estimated as their 18-and-older population in 2012." So much for having a vote of equal value. And the screams of picture ID's are an obstacle to a fair election are heard throughout the county. If votes take the time to vote and want their vote to count equally, then they should be demanding a fair election fostered by a fair process. Did you know both of our legislators, Senator Billy Beasley and Representative Pebblin Warren, along with a majority in the state house, in 2014 accepted a 1.5% annual pay raise amounting to $66/month topping off their nearly $57,000 salary? All of this started in 2007 when the legislators voted themselves,not once but twice, a 62% pay raise with automatic non-debatable pay raises based on the federal consumer index. See the AP 2014 list, coupled with these dropped names from the "House members accepting the raise" John Knight, D-Montgomery; Richard Laird, I-Roanoke; Richard Lindsey, D-Centre; Lawrence McAdory, D-Bessemer; A.J. McCampbell, D-Livingston; Mary Sue McClurkin, R-Indian Springs; Steve McMillan, R-Bay Minette; Darrio Melton, D-Selma; Mike Millican, R-Hamilton; Joseph Mitchell, D-Mobile; Mary Moore, D-Birmingham; Charles Newton, R-Greenville; Becky Nordgren, R-Gadsden;p Arthur Payne, R-Trussville; John Robinson, D- Scottsboro; Oliver Robinson, D-Birmingham; John Rogers, D-Birmingham; Howard Sanderford, R-Huntsville; Rod Scott, D-Fairfield; Randall Shedd, R-Cullman; David Standridge, R-Hayden; Patricia Todd, D-Birmingham; Allen Treadaway, R-Morris; Pebblin Warren, D-Tuskekgee; Margie Wilcox, R-Mobile; Jack Williams, R-Vestavia Hills; Phil Williams, R-Huntsville; Randy Wood, R-Anniston. Note: Senator Jabo Waggoner declined the pay raise. 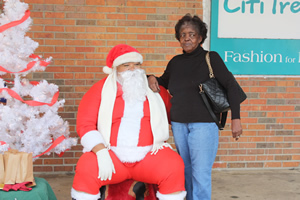 Santa, Douglas L. Nicholson, has been greeting children in Tuskegee for nearly two decades. 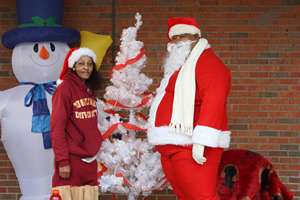 Cheryl Greene, his very capable assistant, obviously equally loves the children of Tuskegee as does Santa, and Santa pulled all of the two-day activity together. 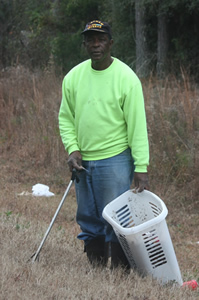 Stopped and thanked Pastor George Wilson, Jr. of Shiloh Missionary Baptist Church on Hwy 29 South on Monday, Dec 19, 2016 for picking up litter on Hwy 55 and filling bags and buckets of everything that can be tossed from a vehicle. You can clearly see the distinguishable hat, the Pastor proudly served our county in Viet Nam and is Army retired. G.W. Lawn Service, on Hwy 55, cell 334-703-7851 will tend to your yard mowing, trimming, bedding, and weeding. Wanting another Japanese Persimmon tree to lengthen and increase my harvest of these tasty fruits, a Google search revealed the trees being grown and sold within 15 miles of my home. Japanese Persimmons along with my muscadines and blackberries are among my favorite fruits. Well, long story short, Allen Deese, the nursery manager, and Eddie Stinson were patient and exceptional in answering all of my questions - including a few on grafting - and just downright nice folks. 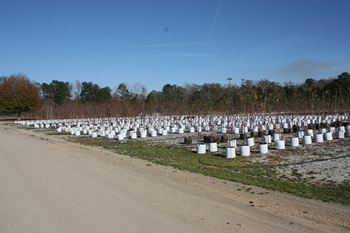 Stinson pulled two trees, trimmed the roots, wrapped the roots, and packaged the plants for only $20/ea. At 67 years of age, I want a good product, good service, a fair price, and a pleasant shopping experience. Deese and Stinson fulfilled my wants in shopping. I noticed while taking my pictures they have hundreds of Anna Apple trees. I planted an Anna Apple in Florida and it was an outstanding producer of good apples. I was taken back Anna Apple trees were not only available locally but grown locally. My persimmon trees are now planted and after the first of the year I shall purchase and plant an Anna Apple and its pollinator. Enjoy the slideshow of the nursery. The beautiful weather in Tuskegee was slightly overcast with a slight breeze and moderate temps while Hurricane Harvey hammers the Texas coast this Saturday morning. A rriving at about an hour before the start of the 10 a.m. parade provided photo opportunities of vendors setting up their booths and enabled me to help Moses Weaver and his Nature H2O Company of Shorter, Alabama and Patrick Wallace's Tuskegee Virtual TV booth with their setups. 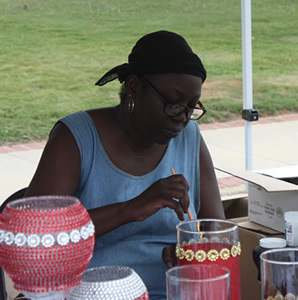 Unlimited food items, shoes, art and speciality items (picture of Elaine here), and community and school activities lined the square. Children of all ages lined N. Main Street from the square to beyond Burger King with cameras and tablets to record the parade. 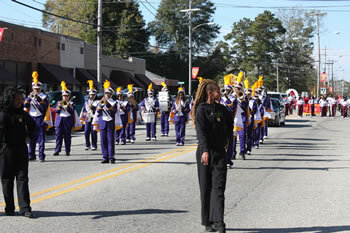 School bands and cheer leaders from GW Carver and Notasulga had fingers popping and feet tapping to the drum beats. I could not resist to thank and encourage the US Forest Service personnel pulling their large recycling trailer in the parade to expand their energies and services further into Macon County. 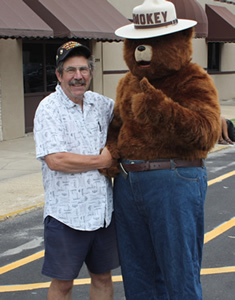 Smokey was a big hit. He was escorted by Drew of the Forestry Service driving the truck. Fire trucks from nearly every county department blasted their horns not in unison, which would have been more enjoyable, but as one lady stated in surround-sound. Dr. Brooks, our School Superintendent drove a truck in the parade. I believe this parade and review was better than last year, though the threatening weather I suspect kept many of the previous parade participants and citizens at home. However, the overcast skies provided a beautiful two hours of weather, camaraderie, and appreciation shown to the veterans of Macon County. Taps concluding the ceremonies played by an USAF Sargent was most moving for me. View sideshow. Dr. John M. House, Colonel, USA-Retired with 26 years of active duty was the guest speaker. Central Alabama Veterans Health Care System (CAVHCS) Interim Director, Traci Solt, was introduced and spoke of her position and responsibilities to our veterans. Met a retired Hospital Corpsman whose path I crossed several times before and after retirement. I always enjoy the company of my uniformed brothers and sisters. The date for the celebration for all veterans was chosen for school participation, and they did. Horses from Shorter, fire and emergency vehicles, TU ROTC, Booker T Washington HS, Tuskegee Middle School, and a special selection of patriotic songs sung by the George Washington Carver Choir. The county, municipalities, and military organizations hosted the honoring of our veterans on Friday, 14Nov2014, to afford the opportunity for our school children to participate in the parade and ceremony. 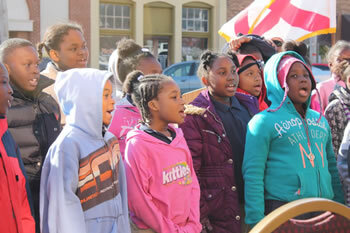 Tuskegee Middle School, Booker T. Washington High School, and Tuskegee University ROTC marched in the parade and the George Washington Carver Choir performed during the ceremony in front of the court house. Curtis Rayborn, retired Lt.Col Alabama National Guard, was recognized for his service and for being the first African American to join the Macon County National Guard. As a retired Hospital Corpsman I was exceptionally proud to hear Joseph T. Williams, retired HMCM and Command Master Chief as the key speaker. And what would a ceremony be in Macon County without the beautiful signing by Rose Washington? Rose performed twice with God Bless America closing the program. I have read of TU President Dr. Brian Johnson's involvement within our community in the local news and to meet him and see him interacting with the students of the George Washington Carver Choir was my pleasure. With citizens young and old lining the parade route, Saturday's activities kicked off with a parade that grows every year. Fire departments from across the county were represented in the parade as well as our schools, college and community groups, such as the Cadillac Club. Children scrambled for the candy tossed by many parade participants. 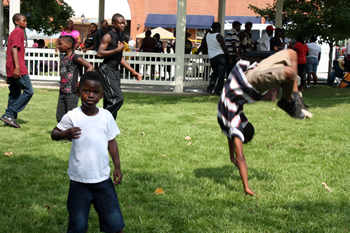 Food, clothing, specialty booths lined the square for our enjoyment along with live gospel and inspirational performances on the large portable stage. I enjoyed a grilled sausage smothered in fried onion and green pepper strips. Seeing the children playing and enjoying themselves was invigorating for this old man. I met some very pleasant people and enjoyed talking with Mr. Whitehead, Mr. McRae, Mr. Robert Johnson, and of course our commissioners. All Macon County Day is an annual event. Groups, clubs, associations, and teams wanting to participate next year it is not too early to begin planning for the fun. Macon County Commission notes - for all of you business persons look at August 22, 2011 entry for the business license schedule and fees. County Health stats - interesting breakdown categories by county across the US. New Word: Ineptocracy (in-ep-toc'-ra-cy) - a system of government where the least capable to lead are elected by the least capable of producing, and where the members of society least likely to sustain themselves or succeed, are rewarded with goods and services paid for by the confiscated wealth of a diminishing number of producers. District 4 Commissioner Mike Berry loves this county and its children. 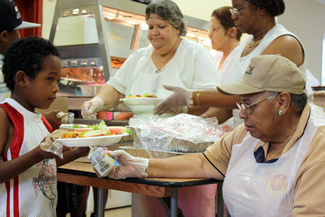 He a ttended a class to obtain a mandatory certification to provide supervised nutrition to our children ages 5 to18 for 7 weeks during the summer of 2013. 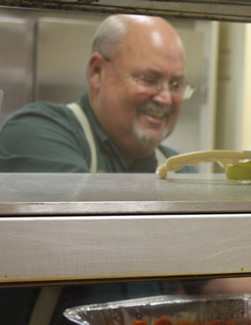 Mike organized his volunteers and was one of three sites in the county to provide nutrition and most likely the only site with supervised indoor and outdoor recreation and study assistance for our children. Many of his volunteers gave of themselves from 8 am to 1 pm five days a week for the 7 weeks. 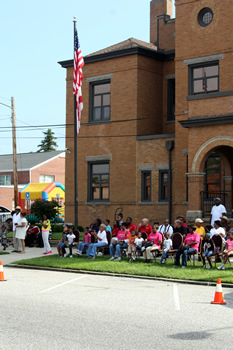 The program included school assistance, movies, outdoor games, and speakers. Well done ladies and gentlemen! Macon County high school juniors and seniors, many of whom are fulfilling requirements for Bridge Builders Alabama, meet every other Tuesday night at Pleasant Grove Missionary Baptist Church on Highway 81 between Notasulga and Tuskegee. Auburn University undergraduates work alongside them, as they develop skills related to life, work, and college. The program is funded in part by the Appalachian Regional Commission. I have met several of the AU students and our local students. I could not be more impressed in the politeness and personal determination our high school students are developing with guidance and encouragement from our AU students. A solid standing round of applause for Dr. Mark Wilson who too gives much of his time along with his AU undergraduates oversees the projects. They are molding and guiding our future business, political, and quite possibly military leaders. For more information Dr. Wilson can be reached at 334-844-6198. All men regardless of race at this point should visit Tuskegee's own Mr. Lawrence McRae's McRae Prostate Cancer Awareness Foundation Website or call 334-226-1177. I not being able to explain and convey the upmost importance of prostate screening to the level McRae is able to do, including a recorded video of he being interviewed by Ms. Barbara Walters, you must learn for yourself first hand from the "Prostate Man." Congressman Mike Rogers - Look at that plane over his left shoulder. No inexpensive coach flying on our dollar for OUR Congressman! Wonder how much that trip cost us. Being military retired none of us looked forward to giving up our free time to prepare for days and wait in formation in the heat or rain for someone to pin on a few ribbons, speak with the troops, and eat a dining room meal before taking off to quit possibly a nice town for an enjoyable layover, commonly referred to as a boondoggle. Ms. Ella Bell is our State School Board District 5 representative - must go! This is not to be taken lightly. Why is this commission working so hard and with such intensity? The Ordinance Preamble reads An ordinance, in pursuance of the authority granted by Act no. 2001-562 enacted by the Legislature of Alabama, May 2001 to provide for the establishment of districts within Macon County, Alabama: to regulate within such districts the height, number of stories, and size of buildings and other structures, the percentage of lot that may be occupied, the size of yards and other open spaces, the density of population and the use of buildings, structures, and land, and to provide methods of administration of this ordinance and penalties for the violation thereof. I am sure you know who this legislation is to benefit. The Planning Commission and Macon County through collection of unnecessary fees. There is no benefit for me in being told how I may use my property for legal activities. There are laws on the books not fully enforced now so why have more laws and bureaucratic growth at a time when Macon County is experiencing financial belt tightening. If you do not want to give up your rights to freely use your property then do not sign a petition being taken door to door here in Macon County and should it get on a ballot vote NO or give up your property rights and continue paying ad valorem taxes. The Commission is currently not meeting, which is a good thing. The Alabama Limited Self-Governance Act (tinyurl link), Development Plan, Economic Development Plan (2010), Proposed Zoning Ordinance (tinyurl link), Proposed Subdivison Regulations, and Hazard Mitigation Plan, Highway Functional Classification System, Macon County Workflow Commuting Patterns, Traffic Counters, Fed & State Hwy Traffic Counters. SCADC Revolving Loan Unit information and forms, Macon County Solid Waste Management Plan part a and part b., Comparison of Alabama Counties 8th ed. All residents of Macon County eligible; no health restrictions, no sign-up fees or deductible. If you do not have a free discount prescription card through Coast2CoastRx you may very well be tossing your money into the wind. Additional benefits include dental, vision, hearing, and veterinary prescriptions. Sound too good to be true, check it out and sign up today before going to your dentist or other health care provider. Cards are available on Coast2CoastRx web site, most pharmacies in the county, county and town offices, and library.